Please feel free to forward this announcement to your non-flying friends and families to give them the opportunity to enjoy the flying experience! LEE’S SUMMIT, MO, Oct. 16, 2012 — The Aircraft Electronics Association is deeply saddened by the passing of Monte R. Mitchell, former president of the association and a legend in the avionics industry, who served nearly 40 years in the general aviation industry. Born Feb. 6, 1929, in Quincy, Mo., he passed away Oct. 16, 2012, in Lee’s Summit, Mo., at the age of 83, following a brief illness. 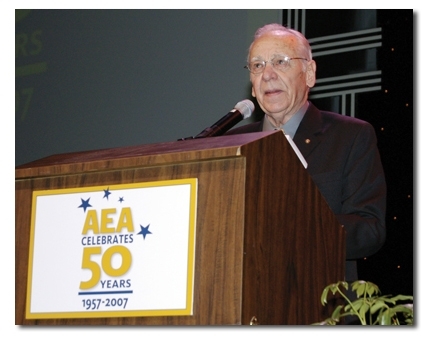 Mitchell served first as the AEA executive director, then as president of the association from 1977 to 1996. He received the 2007 AEA Lifetime Achievement Award during a ceremony at the 50th annual AEA International Convention & Trade Show in 2007, at the Grand Sierra Resort Theater in Reno, Nev. The AEA Lifetime Achievement Award is presented for exemplary service to the general aviation industry and is the highest honor bestowed upon an individual by the AEA board of directors. Mitchell’s career in aviation began in 1956, when he joined Wilcox Electric Co., a transponder manufacturer. When he left Wilcox in the mid-1970s, Mitchell became vice president of marketing at a new face in the aviation manufacturing industry, Bonzer, where he was responsible for marketing its line of radar altimeters. In 1977, Mitchell was recruited for the position of executive director of the AEA. Up to 1977, a volunteer staff managed the AEA. Realizing the potential for growth and the work involved, the board of directors decided to hire a full-time, paid staff to properly grow the AEA. During his tenure as AEA president, Mitchell tripled the membership size and introduced new programs and services to the members, including the EEDirect equipment exchange program and the annual AEA Rate & Labor survey, and he quadrupled the size of the association’s monthly magazine,Avionics News. Under Mitchell’s leadership, the AEA reached beyond North American borders and hosted the first AEA Europe Regional Meeting in Zurich, Switzerland, in 1987. Today, AEA membership reaches every corner of the world in more than 40 countries. On Aug. 17, 1994, Mitchell stood next to President Bill Clinton inside the Oval Office of the White House during a signing ceremony, as Clinton signed the General Aviation Revitalization Act of 1994. The law reduced the liability faced by aviation manufacturers, and production gained momentum from its lowest levels. The cost of liability insurance had previously reduced the investment into research and development by general aviation manufacturers. Mitchell led the AEA’s efforts to help pass the landmark piece of legislation. Mitchell also led the establishment of the AEA Educational Foundation to help promote careers in the aviation maintenance industry. Since its inception in 1990, the AEA Educational Foundation has awarded more than $1 million in educational scholarships to students. Mitchell was united in marriage on Feb. 14, 1954, to JoAnn Ryan Mitchell. She preceded him in death on Aug. 16, 2000. Together, they had three daughters: Debra McFarland, Paula Derks and Lisa Lufft; three son-in-laws; and six grandchildren. Two of his daughters, Debra McFarland and Paula Derks, followed in Mitchell’s footsteps. Currently, they help lead the AEA with Derks serving as president and McFarland as executive vice president. In addition, one of Mitchell’s grandchildren, Lauren McFarland, serves the AEA as manager of marketing and advertising, making three generations of family service to the association. A U.S. Army veteran, Mitchell served his country in the Korean War. He was a deacon and member of the Noland Road Baptist Church in Independence, Mo. A memorial website is available for family and friends to leave a tribute atmontemitchell.forevermissed.com. A visitation for family and friends is scheduled for Saturday, Oct. 20, from 9:30-11 a.m. CDT at Speaks Suburban Chapel; 18020 E. 39th Street; Independence, MO; 64055. A memorial service will immediately follow the visitation. In lieu of flowers, donations may be made to the AEA Educational Foundation; 3570 NE Ralph Powell Road; Lee’s Summit, MO; 64064. For more information, contact the AEA headquarters at 816-347-8400.